ACP Marketing provides global travel marketing and distribution solutions. Client rail companies such as BritRail and most European railways have been attracted by ACP's active sales & marketing teams located in major markets around the world and its innovative distribution systems which have simplified the process of selling and increased product awareness. To book our complete range of train tickets and rail passes please visit www.acprail.com. 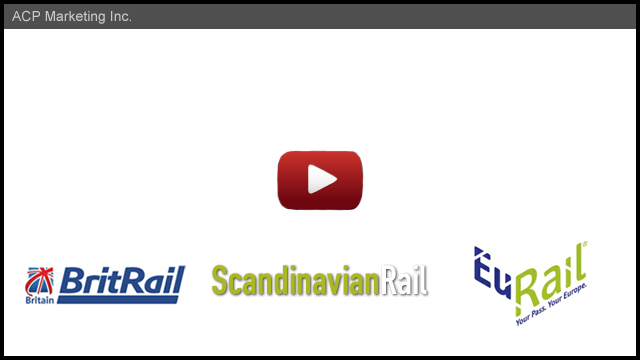 our railway partners are available on all GDSs worldwide. Since 1994, ACP Marketing has been the dedicated marketing expert that European, British and many other world railways have turned to for distribution, sales and marketing strategy. Known for being an official partner of BritRail since 2000, ACP Marketing continues to entice international travelers to visit Britain and explore its countryside by train. With a number of key rail partners ACP Marketing has an ever growing product portfolio, including Eurail, Scandinavian Rail, Japan Railways, Rail Australia, German Rail, Renfe, Trenitalia and more. On behalf of its partners, ACP Marketing sells rail passes, train tickets, attraction passes, ground transportation and seat reservations. With a passion to promote rail travel thanks to its convenience, fast and frequent service, enjoyable scenic experience and environmentally friendly advantages, ACP Marketing aims to be a one-stop-shop for travelers worldwide. Additionally, under our AccesRail brand we are industry leaders in championing rail-air intermodal travel. Now over 100 airlines have interline agreements with AccesRail to facilitate booking rail and coach together with air on one intermodal ticket. Like for any airline, travel agents can easily book AccesRail’s inventory on the primary screen display of all major GDSs around the world, using our own IATA designator code 9B. This intermodal solution benefits all partners with the potential for higher load factors and greater reach to more destinations, while offering the customer a seamless travel experience and possibly better connection times. With a global presence, innovative distribution channels and a mission to ensure that railway partners are able to reach, inform and sell to customers on an international level, ACP Marketing looks forward to further expansion and success. The World Headquarters of ACP Marketing is located in Montreal, Canada and there is a Regional Office in London. The sales force is based in key markets to offer local expertise to the trade from New York, Mexico City, London, Berlin, Brussels, Rome, Madrid, Beijing, Seoul, Sydney, Tokyo and New Delhi. ACP Rail International was the first non railway owned, private company to be granted a global Eurail contract in 2003. At the time, the objective of the Eurail Group was to use ACP to bring a fresh approach and a new dimension into the Eurail Pass distribution market and thus drive new sales. Eurail saw ACP as an ideal partner with a global distribution system and a ready-made network of sales outlets. The East Japan Railway Company was attracted by our AccesRail brand to manage the distribution of its line of rail passes via the GDS. This new arrangement broadens the JR East Pass's availability to about 120,000 worldwide locations. The system also allows the passes to be sold freely as E-Tickets redeemable in Japan. All JR East Japan train stations are now using our e-ticketing solution. Please note this is not a retail or order pick up location. Please call to place an order or to speak to a representative.